Pontydysgu were invited to run some workshops with year 5 pupils for Tonypandy Junior School’s Tech Day. The school had purchased a set of 5 MaKeyMaKeys and were keen to see them in action. Introduce the components of the MaKeyMaKey and see if the pupils could work out for themselves what each bit did and what a MaKeyMaKey might do . Have each group assemble the kits and play banana bongos. Have each group make a salad piano. Have each group make a human drum kit. Play pac-man using a foil controller. That sounds like lots of fun but what’s the point? Well for a start setting up the MaKeyMaKey is like setting up a simple circuit, so you’re covering basic electronics and physics right there. MaKeyMaKey is a connection between you and your computer, you could call it a ‘tangible user interface’ it gives a physical form to digital information. 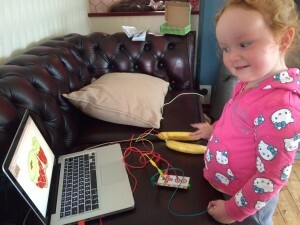 Using MaKeyMaKey helps you understand a bit about how your computer works whilst allowing you some insight into how your computer could work. It should inspire creativity and spark an interest in computing beyond what you can do with a keyboard. You can use MaKeyMaKey to control any simple program, which means you can write your own simple program in Scratch and use it with MakeyMaKey. There are lots of examples here. MaKeyMaKey has lots of cross curricular connections. See our post about making a cardboard guitar for an idea which could encompass an art and craft project, musical composition, playing music in a group, electronics and programming. Testing out the workshop plan with my three year old daughter. 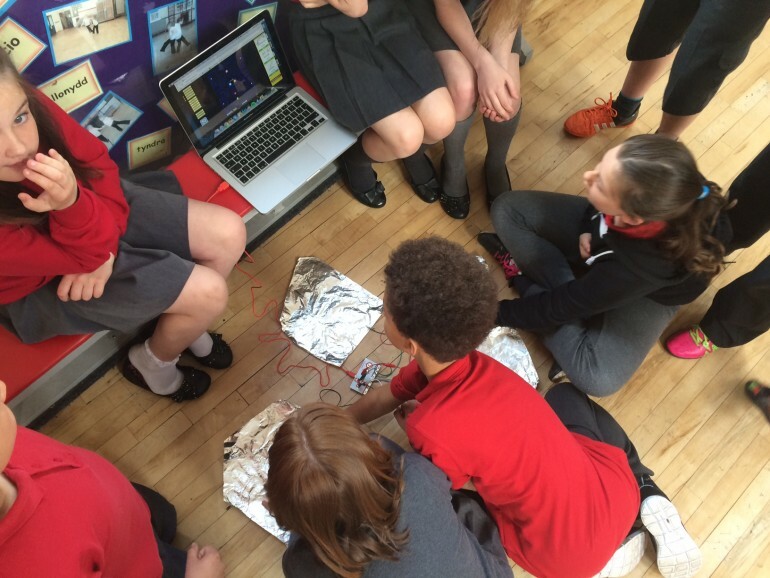 Each group had 15 pupils so I split them into groups of three where each group had a laptop and a MaKeyMaKey. I did not give out the fruit and veg at the start because I wanted them to focus on the components and also because this was the first time they had seen MaKeyMaKey and I didn’t want to spoil the surprise. To set up the kits I held up each component individually saying “What do you think this does? Where should we put it? That’s right, now plug it in like this.” With five small groups it was easy to manage this way with them participating and then copying the instruction. Other classes might have benefitted from some assistance. Next I directed them to the MaKeyMaKey bongos site, some groups started to use the arrow keys on the keyboard so I told them “We are only allowed to use bananas!” By this point the box of fruit and veg was still well hidden and the pupils looked at me like I was mad. I pulled out the bananas, some of them exchanged puzzled glances. I told them to connect crocodile clips to the bananas, they did, laughing. One boy shouted out “Well I’d never have believed it if I hadn’t seen it with my own eyes!” When they’d been playing bongos for a few minutes I gave them more veg and the url for the piano. I also went round the groups individually and showed them that whoever was holding the earth wire had to complete the circuit so they could hold hands and have more than one person play or use the hand touch to make the sounds. Next I gave out the url for a drum machine and had them use each other as the drums by high-fiving to complete the circuits. To finish off the first hour the pupils were gathered around one computer, I introduced the cardboard guitar I had made the previous evening and asked them how to set it up, which they did. They then took it in turns to play a few notes each whilst I asked the others to come up with a list of things they could do with a MaKeyMaKey. Fortunately they came up with “play computer games” which lead us nicely into the second session. The group returned from break to find paper and pencils and I showed them an example and asked them to design five buttons they could use to control a game with. The plan was to clip the crocodile clips to the paper and use the pictures to play pac-man. Unfortunately for this to work, the graphite lines need to be thick and dark and on very smooth paper. I had this in mind but in reality only one of the 15 attempts was successful. Next I got them to use each other as games controllers, they played one-button-bob using only fist bumps which meant they had to work together quite carefully to progress through the game. Throughout the whole session we talked lots about what games would work and what other materials we could use. We discussed making a selfie camera for the class snail to take a photo when it slid over a certain part of the tank, about using play dough or coins or sandwiches or bowls of water in place of fruit and foil. We even discussed whether or not we could write an email using alphabetti spaghetti. And finally the whole group helped make a table sized controller for Pacman out of foil and finished off the session with a Pacman tournament. I had the same problem with drawing game controller buttons until I discovered Lyra Graphite Sticks – 6b is good, 9b even better. They work like a dream and last a long time.